Tea is the national beverage of China. Chinese are believed to have enjoyed tea drinking for more than four thousand years, the longest in the world. In Traditional Chinese culture, tea drinkers were always considered to be elite and are highly respected by society. Drinking tea also demonstrate personal morality, education, principle and social status. This is why serving tea gradually became an essential part of Chinese social life. In modern China, even the simplest dwelling has a tea set and a water heater for making a hot cup of tea. These implements are symbols of welcome to visitors and neighbors. Traditionally, a visitor to a Chinese home is expected to sit down and drink hot tea while talking. Traditionally, a visitor to a Chinese home is expected to sit down and drink hot tea while talking. 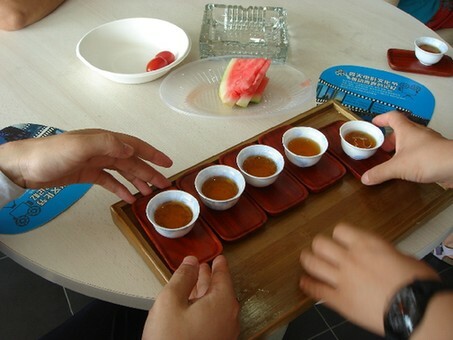 In Chinese culture, it is also a sign of respect to serve someone tea. A younger person can show respect and thanks to an older person by offering them a cup of tea. This is especially common during big events, like birthdays and during spring festival. In a traditional Chinese marriage ceremony, both the bride and groom kneel in front of their parents and serve them tea. This is a way of expressing gratitude to their elders for raising them up. Also, in modern China, tea is an important social tool. People go to tea houses, not for the drink, but for a place to meet with people. So the next time, if someone ask you out for a cup of tea, it is actually an implicit way to invite you to a gathering. Over the course of 4 thousand years, tea has also had a major influence on the development of Chinese culture. Tea is a mainstay in Chinese literature, arts, philosophy and also religion. Tea is connected closely with Taoism, Buddhism and Confucianism. Going back to the Tang Dynasty 15 hundred years ago, drinking tea is seen as an essential part of personal cultivation. Also starting from the Tang Dynasty is the tea ceremony. From there, the art form spread to neighboring countries including Japan and Korea. Unlike the world-renowned Japanese tea ceremony, the Chinese one emphasizes the tea rather than the ceremony, like the taste of the tea and the difference between various cups.